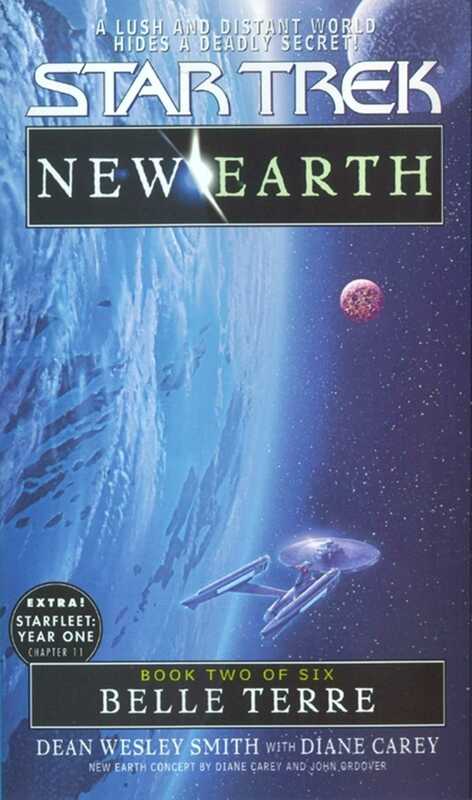 The Starship Enterprise has embarked on its most ambitious assignment yet: to lead a courageous band of settlers to a far-off planet, to defend the fragile colony from alien threats, and to unravel the mysteries of a brand-new Earth! A six-month distance from the Federation, the planet Belle Terre offers a new life to more than 30,000 families, pioneers, scientists, expatriates, go-getters, loners, and entrepreneurs, all under the watchful eye of Captain Kirk and his crew. But the would-be colonists have barely settled in the untamed wilderness of their new home when Spock makes a startling discovery: not only does the planet's moons contain a rare ore of almost inestimable value, that same moon is also violently unstable. Within months, it will inevitably explode -- destroying all life on Belle Terre! Captain James T. Kirk dropped into the soft sand and leaned back against a large log of driftwood. In front of him the dune slanted down to the beach and the green-tinted ocean beyond. He tried to think back to the last time he had simply sat alone on a beach and relaxed. He couldn't remember ever doing that. But he also couldn't imagine this was the first time, either. He must have relaxed on a beach before, although he had no doubt Dr. McCoy would swear it had never happened. McCoy always said that James Kirk never relaxed. Kirk supposed that was true. Maybe it wasn't too late to learn. Or more likely, it was time to learn. He took a deep breath and looked around. There was a slight bite to the ocean breeze coming in over the waves, just enough to take the edge off the heat of the midday sun. The salt and brine smell drifted over the beach, strong enough to be enjoyed by a new arrival, but not overpowering enough to be noticed after the first few moments. The beach sand was almost a pure white, and stretched in a ribbon as far as he could see in both directions. This planet Belle Terre was everything Governor Evan Pardonnet had said it would be. If this stretch of shoreline near the main colony compound was any indication of the rest of the planet, it was no wonder so many people were so willing to travel so far to get here. Even putting aside the governor's high-minded ideas of freedom of thinking, freedom from government, and freedom from the Federation, this place just might turn out to be the utopia Pardonnet had hoped for. Below Kirk, ten children, chaperoned by Lilian Coates, played a game a few hundred paces down the beach to his right. The sound of children cut between the gentle slapping of the waves rolling up the sand, then retreating. The laughter and childish shouts of joy were wonderful reminders of the perfect afternoon he was having. As a starship captain, he hadn't had many like this. He almost stood to go and see how the children were doing, then stopped himself. He had come here to relax. And relax he was going to do if it killed him. He laughed to himself, the sound carried away on the slight breeze. McCoy would be proud of him. Shocked, but proud. Kirk took another deep breath and stared ahead. The tinted green of the ocean spread out as far as he could see. The waves were no more than gentle rolling swells. The few clouds in the sky were white, puffy, and nonthreatening. He took a third deep breath of the clean, fresh air and could almost feel the muscles in his back starting to loosen. It wasn't often that he took a few minutes to himself. And after getting the sixty-two thousand colonists and all their varied ships to this paradise, he deserved the time. If he had his way, he was going to take more time, as often as his Starfleet duties of protecting the colonists allowed. At the moment a large number of his crew were scattered in twenty different groups over the planet, helping the colonists explore, carve out settlements, and load supplies and equipment to the surface. Every one of his senior officers except Spock had charge of a major operation. And from what he'd been told before he beamed down, everything was going smoothly. At this point, only two weeks after arriving, just about every one of the colonists was living on the surface of the planet, an unprecendented accomplishment. The Enterprise was in orbit, standing ready to defend the colony ships from any more threats from the Kauld or their new Orion allies. A fleet of Kauld and Orions tried to keep the colonists from reaching this planet, but Kirk doubted they'd have much trouble from them again immediately. The Enterprise and the colonists defeated them handily, but Kirk had no doubt that the Kauld and their enemies the Blood would be back. The Blood leader Shucorion claimed to be a friend to the colonists, but Kirk wasn't so sure of that. The Blood/Kauld conflict would cause the colony trouble at some time in the future. At the moment everything was going fine. There was time enough to get the colony started and get crops growing. And time for him to relish this beautiful new world just a little. He reached for his communicator to check in with the ship, then stopped himself once more. There was also time for him to take a few moments to himself. They could find him if they needed him. He ran his hand through the soft sand, then gazed off down the seemingly limitless beach. Belle Terre was just about as close to Earth as a colony could find. The climate here on the major continent was moderate and the growing seasons uniformly long, thanks to this planet's orbit around its sun. Pulling guard duty on Belle Terre for the near future wasn't going to be so bad after all. There weren't many better places he could think to guard. But he couldn't imagine spending his life here, either, no matter how beautiful the place was. Space was too big, with too many mysteries to explore. He didn't mind guarding this colony for a while, as long as they needed him and the Enterprise. It was a challenge unlike any he had had before. But when this was done he wanted to get back into deep space. Down on the beach a child laughed, drawing Kirk's attention that way. He smiled as the children all piled on each other, kicked up sand, laughed some more, then scattered, playing some game Kirk wasn't familiar with. Lilian Coates, her blond hair loose in the ocean breeze, her shoulders straight, her hands in the pockets of her light jacket, stood between the children and the ocean, watching, laughing along with them. Kirk was amazed that she could even laugh at this point in her life. Her husband had been one of the many colonist casualties on the way here from Earth. With his death, her husband had left her far from home, alone on a colony world. Suddenly without a family, she had to take care of herself and their nine-year-old son, Reynold, in a very harsh and unfamiliar environment. That would be tough on anyone, and would destroy many. But Lilian Coates had just seemed to keep right on going. He had met her a few times right after her husband had died. She was a strong woman, of that there was no doubt. She was doing just fine, or so it seemed at the moment. Maybe in a few months he'd make it a point to make sure that hadn't changed. Strong people like her were exactly what this colony needed for long-term survival. He watched her guard the children for a moment, then settled back against the log, closed his eyes, and let the sun warm his face while the ocean breeze cooled him. If lucky, he just might be able to spend the entire next hour right here, undisturbed by the responsibilities of protecting an entire new world full of colonists. "Captain?" Spock said from behind him. It didn't seem as if the luck was with him. Kirk sat up and opened his eyes. Below him Lilian glanced up his way, noting for the first time his presence, then went back to sharing a laugh with the children. He turned to stare up at the Vulcan as he approached through the sand. "What is it, Mr. Spock?" "The results of my tests, Captain," Spock said, handing him the scientific tricorder he carried. "Couldn't it have waited?" Kirk asked without looking at the report. "I was enjoying a little time away from reports just like this." Spock had been concerned about slight communication problems they'd been having when not in Gamma Night. Before Kirk had beamed down, Spock had been focusing his attention on one of the moons of Belle Terre everyone called the Quake Moon, because it seemed always to be shaking with small quakes, more than likely caused by volcanic activity. Spock had a theory that the communication problems came partly from the moon and had been so intent in his project that he hadn't even wanted anyone talking to him. "I'm afraid," Spock said, "that time is not something we have an abundance of, Captain." Kirk stared into the expressionless face of his first officer, then turned his attention to the report. Two words caught his attention instantly. "Quasar olivium?" he asked, glancing back up at Spock. "In the Quake Moon?" "Yes, sir," Spock said. "It seems we have found the first naturally occurring deposits of the material." Kirk shook his head, trying to clear it, then stood as he tried to remember everything he knew about the material quasar olivium. He knew it was named after the scientist Shultz Oliver, who first theorized that the material existed. According to all rules of physics, the material shouldn't exist. And just a few years ago the Federation had been able to construct minuscule portions of it at huge costs, by using factory-sized warp facilities. Yet now Spock was saying the material existed inside one of the moons of this planet. "Quasar olivium?" Kirk asked. "How is this possible?" "I'm not certain, Captain," Spock said. "Olivium is formed in the heart of a quasar and rarely survives the process that creates it. It has never been found to exist in a natural state. Until now." "Right," Kirk said, still trying to get the idea into his mind. "Until now. How much is there?" Spock shook his head. "The material is in a constant state of quantum flux. I have no way of measuring the amounts accurately." "An ounce?" Kirk asked. "A pound? Ten pounds?" Spock shook his head. "Far in excess of hundreds of thousands of tons, if my readings are correct." Kirk leaned back on the piece of driftwood he'd been sitting against earlier and simply stared at his first officer. "Hundreds of tons?" Kirk said. "Spock, do you know what this means to science? To the Federation?" "I do, Captain," Spock said. Kirk nodded. More than likely his first officer knew even better than he did what such a discovery would mean. The technological advances that would be possible with just a few pounds of olivium were fantastic. Having tons of the material would change everything. More powerful replicators could be built that could make useless molecular structures into useful ones. Greater holographic technology, advances in medical science, advances in computers, more powerful weapons. The list of advantages of controlling tons of olivium went on and on, and that was just what he knew about. He had no doubt the discovery would be far more important than he could even imagine. The Belle Terre colony was just about to become the richest colony in existence. And the most sought after by every race in the sector. And the most important colony in all of space for the Federation to defend against anyone who would try to take it. Governor Pardonnet had led these people way out here, in part, to get away from the massive restraints of the Federation bureaucracy. It seemed that now he was going to need the Federation and Starfleet even more just to survive. Kirk had no doubt that when word of this discovery got out, the Klingons, the Romulans, and just about everyone else would all try to gain some foothold in this pristine backwater. Behind him the children laughed and the waves broke gently on the sand. Those kids didn't know how important to their future Mr. Spock's discovery was. "There is another problem, sir," Spock said. Kirk managed to force his thinking away from the possibilities and realities of olivium in that quantity and back to the passionless face of his first officer. "I can think of about a thousand problems, Mr. Spock. What are you saying?" "The quasar olivium is, by its very nature, unstable, existing almost more outside our space and time than in it. The center of the Quake Moon that seemed hollow to normal sensors actually holds the olivium in a very contained state." "The bottom line, Mr. Spock," Kirk said. "The pressure inside the moon is building and has been for some time. The moon will explode, and in the process will destroy all life on this planet, as well as vast quantities of the quasar olivium." "Explode?" Kirk asked. "Are you certain?" Kirk nodded. When Mr. Spock said he was certain, the event would happen. "How did we miss this?" "The moon's crust and the very nature of the olivium makes scans difficult," Spock said. "So far I have been unable to ascertain the exact time of the explosion, again owing to the nature of the olivium." "A day? A week? A year?" Kirk demanded. "I'm looking for a range, here." He was suddenly very aware of the children shouting below him in their play. Kirk stepped closer to his first officer and lowered his voice. "You've got to give me an approximate time when the explosion might happen. I've got over sixty thousand colonists to get off this planet and out of harm's way." "My data is insufficient to allow me to predict the explosion exactly, sir," Spock said. "But it is logical that at the rate of increase of pressure inside the moon, the explosion will occur between six days and one month from this moment. I might be able to give you a more accurate time frame in a few more hours of research." "Do it," Kirk said. "Quickly." Mr. Spock turned and moved away. After a few steps Kirk stopped him. "Spock, can we stop the explosion?" "I do not yet have enough information to give you an answer, or a possible method of doing that, sir." Spock nodded and moved away through the sand toward the closest beam-down point. Kirk turned and looked back at the children below. One moment these colonists faced a future of vast riches, the next they faced death and being without a home. All in the same report. Kirk snapped open his communicator. "Kirk to Enterprise. Come in." "Go ahead, Captain," Ensign Jason said. Ensign Jason was a young kid from Boise, Idaho, fresh out of the Academy. He was filling in for Uhura while she led a party working on setting up a communications base just south of Kirk's position. "Ensign, find Governor Pardonnet and inform him that I need to speak to him at once." Pardonnet, on the trip here, had often been hard to work with, but Kirk actually admired the young governor. Granted, Pardonnet's ideas of leading and Kirk's were vastly different. And they had often had discussions about decisions. Actually, they hadn't been so much discussions as Pardonnet talking on and on. But with this emergency the governor wasn't going to have a chance to have one of his discussions. He was going to follow Kirk's orders and be quick about it. They didn't have time to argue too much with the lives of the colonists at stake. "Understood, Captain," Ensign Jason said. "Where would you like him to meet you?" Kirk knew that if he had the governor meet him, it might take hours. And right now, as Spock had said, there weren't hours to spare. "Ensign, just get his location and give it to the transporter room. Then tell him I'm coming to talk to him. Tell him it's an emergency." "Understood, Captain," the ensign said. "And Ensign -- have all the crew report back to the Enterprise at once. No exceptions. Kirk out." Kirk glanced down at Lilian Coates and the playing children. She seemed to be watching him almost more than the children, as if she could sense that something was wrong. Maybe if they survived this, he'd explain to her what he had been doing here. With one more deep breath of the fresh ocean air, he said into the communicator, "Transporter room, do you have the governor's location?" "I do, Captain," the answer came back. "Then beam me there at once." A moment later, while he was staring out over the ocean, the transporter beam took him. So much for resting and relaxing. He just hoped it wasn't going to be the last time he got the chance to look over this ocean on this beautiful planet they had come so far to find. Lilian Coates watched as Captain Kirk transported away, not even bothering to take the time to go to a normal transporter location. She had a sense that something was happening, and that something wasn't going to be good for the colony. As a child she had called her feelings before something went wrong "the fist." At the moment the fist was working full-time. It felt as if a deep sense of dread had clamped a hand around her stomach and was squeezing so tight that not even the beautiful day and the white sand of the beach could help relax it. It was the same feeling she'd had just before her father had died of a heart attack. The same feeling just before her husband, Tom, had been killed. Now it was here again. She turned and looked out over the calm ocean, trying to let the waves soothe her fears. She was making up problems, she was sure. More than likely the captain had simply been called away by a routine action. This planet was so peaceful, so tame, what could be going dangerously wrong? Maybe Kirk and Pardonnet were disagreeing on some way of dealing with colony protection again. She usually agreed with Kirk when she had heard both sides, even though Pardonnet was the reason she and Tom had signed up for this colony. And even with Tom dead, she still believed in the dream Pardonnet had for this planet. She loved the idea of less government, more freedoms. She could listen to Pardonnet talk for hours on those subjects. But when it came to defense and protection of the planet and the colony, she had always agreed with Captain Kirk's ideas. She stared up at the area near the log on the sand dune where he had sat. It seemed very empty without him there. And the fist holding her stomach wouldn't let go. She focused her attention on the children. Her son, Reynold, was playing with them. Since her background was in education, she had offered to watch the group of same-aged kids while their parents worked on setting up the colony. In a few weeks, they might even start some sort of formal school for all the children. But for the moment, she was just a glorified baby-sitter, and happy to be doing that much to help. The children were done with their game, so she started them back up the beach toward the path to the main colony. Another hour and it would be dinner break and all the kids would join their parents. Maybe by then she would find out what was happening. And why Captain Kirk had to leave the beach so fast, before she had even had the chance to say hello. In her stomach, the tight feeling of dread squeezed even harder.